This year we actually made it to the parade before it started. The past couple years we sorta just showed up when we showed up. But when you have to get everyone dressed, sunscreened, and cart everyone to the parade you might as well get there on time. This time we parked right behind some new friends that happened to visit West Hills church some weeks ago. They were considering going to West Hills church and then we happen to park right behind them. We plan on meeting up with them again too. 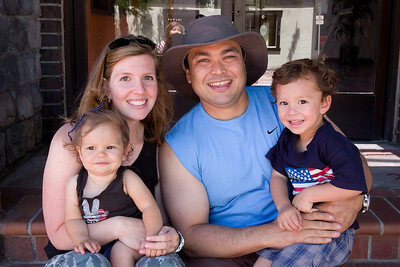 Here’s a photo of the family at the parade. 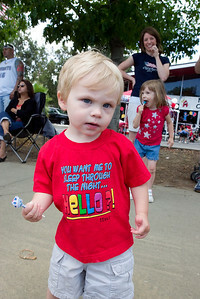 Here’s a photo of one of our new friends kids. 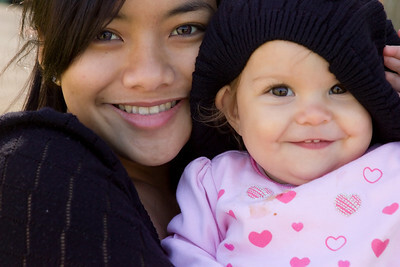 The daughter is in the background and the mother is right behind her. The father is just off the picture on the right. We actually had a very good spot right in front of the announcement booth, so we heard a description of everything that was in the parade. We learned things about the parade that we never knew. 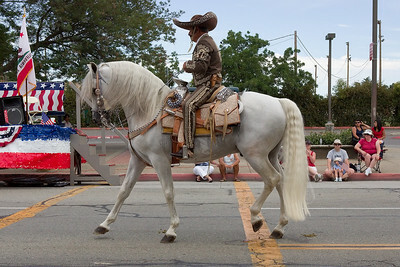 For example, this guy on the horse we see every year, but we never knew that he get top awards in various shows and he’s wearing a traditional Mexican outfit and looks forward to being in this parade every year. He’s been doing this for a long time too. I think it was something like 15-20 years. 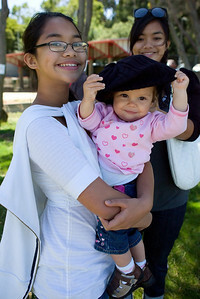 We had a fun day in San Francisco with our cousins Priscilla and Dita from Guam. We had a full 13 hour day. Started at the Ferry Plaza, where we had lunch, Gelato and I was filmed with Matthew answering a question for Eplay.com on whether I would be willing to move to Mars. Next, we stopped just north of Pier 39 and visited a ship museum adjacent to Fisherman’s wharf that I’ve never even seen before. We also visited Girradelli square and had some cupcakes. That was a load of fun. 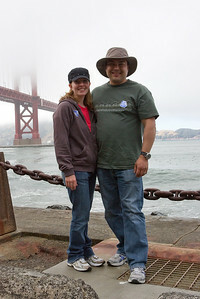 Next, we stopped just under the Golden Gate bridge and took some photos at a spot that Jenn and I had once taken photos of ourselves long ago. Next we drove around some hilly roads until everyone screamed and had enough. Next, we found BiRite creamery were we tried some hand made ice cream (Salted Caramel, Snickerdoodle, and Cookies and Cream) all made from scratch and tasting delicious! Next we went to Twin Peaks and froze our buts off and couldn’t see anything through all the fog. Next we went to Krispy Kreme and had some “HOT NOW” donuts! And finally, we headed back to drop the cousins off in Palo Alto and found a Mexican spot where we were officially tired, done and full! Here’s a photo of Jen and I with our new hats at that old spot. I’ll have to dig up that old photo and post them side by side. 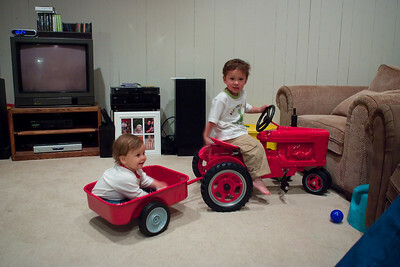 We bought Matthew a fancy new pedal tractor and even before that there was a nice tricycle. The combined value of those two is over $400! 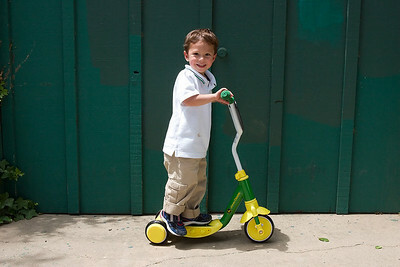 But his favorite thing to ride is a scooter in John Deere colors given to him by his thrifty Nana Lynn in Alabama. Thank you Nana Lynn! Thankfully, that pedal tractor is a collectors item that will look good for many years to come. And made in the USA. A while back we had some fun with bubbles. Those new bubble blowing machines are actually quite a bit of fun. But I recommend you have kids around that go crazy. Otherwise, you’ll just be a bunch of adults standing around looking silly! 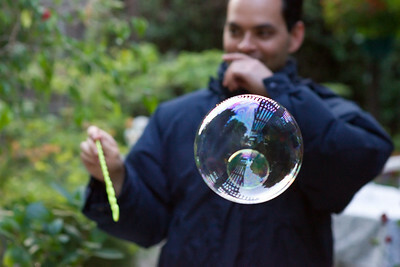 My brother blew a bubble that is captured with a reflection of the backyard. Look closely at the original size image in the gallery and see if you can recognize what you see in the bubble. 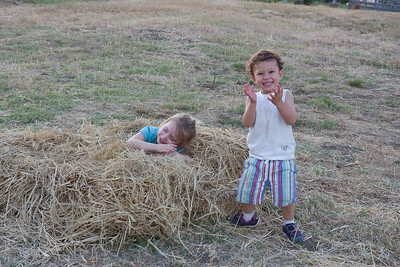 We visited the Live Earth Farm Summer Solstice festival. It was actually a very strange day. It was probably 105 degrees in San Jose, but when we headed over the hill into Watsonville, towards the ocean, the sky was darkening and lightening was streaking across the sky. The lightning was striking in the hills that we were travelling through and causing forest fires. We drove right past a forest fire at the base of an electric tower that we could clearly see from the road. There were many people who stopped their cars on the side of the road to watch. In Watsonville it was only around 63 degrees and the sky was dark and it was raining! After we parked, the sky cleared and the temperature quickly climbed to the upper 80’s. Later, I was taking breaks from the sun because I was sweating like crazy! A strange day indeed. There’s not a lot of photos, but there are a few of us. Our friends Jill and Brian and their daughter Anny joined us that day.